The hub of social activities for our members is The Harbor Club, a beautiful dining establishment featuring spectacular views of the lake as well as delectable modern American fare. 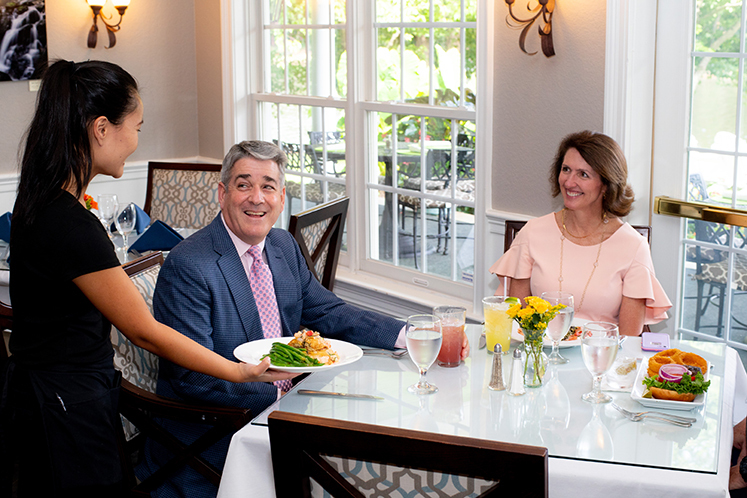 The Harbor Club’s upscale casual dining menu offers a wide variety of perfectly prepared items, including locally sourced seasonal specialties and family-friendly options. In the spring and summer months we use fresh vegetables and decorative flowers grown on-site in Ginny’s Garden. Our staff maintains the highest standards of service, tending to your needs with a smile at every turn. Expected in fall 2019, The Harbor Club will undergo a major expansion designed to meet the needs of a growing community and to serve our members better. Included will be a dedicated ballroom for exclusive large events, an enhanced kitchen facility, and a highly anticipated private members’ grill. Make yourself comfortable at The Harbor Club—because you belong here. For reservations, e-mail us at reservations@fawnlakecc.com or call (540) 972-6200.